Trying to eat healthy onboard Paradise is difficult and dining options are limited. The only specialty restaurants onboard are Guy's Burger Joint, from Food Network personality Guy Fieri, and BlueIguana Cantina, Carnival's popular Mexican restaurant -- both are free. As for the main dining choices, cruisers can choose from either the dining room or the buffet. We preferred the dining room to the buffet but found the food to be heavy in both venues. Although the quality of dining could be improved, the desserts were some of the best we've had on mainstream cruise ships -- not dried out, but moist and flavorful. The main dining rooms have two options for dinner: the flexible Your Time Dining, from 5:45 until 9:30 p.m. in Elation dining room, or a set time each evening (6 or 8:15 p.m.) in Destiny. Cruisers who select the set times are seated with the same tablemates and waiters at the same table each evening. Your Time Dining allows for more flexibility but you'll have different tablemates and waiters, and may have to wait until a table is available. With the exception of the sea day brunch in the Elation dining room, the only true lunch options are at the Paris Restaurant (buffet) on the Lido deck, grabbing a burger at Guy's or a taco at BlueIguana before 2 p.m.
Destiny and Elation Restaurants (Deck 8): Both of Carnival Paradise's main dining rooms have low ceilings and a mix of booths and tables, with simple decor and a handful of massive oval mirrors and maroon light fixtures. Destiny is reserved for set seating dining, while Elation is where Your Time diners go for dinner. Trying to get to the Destiny Restaurant was a challenge in itself because the galley is situated between the two main dining rooms, thus blocking the flow of traffic. The restaurant has a center stairwell that leads to the Rotterdam Martini Bar, so cruisers can grab a drink before -- or after -- dinner before descending to the Destiny Restaurant. Both dining rooms are only one floor, so you don't have that elegant, grand feeling with high ceilings as you sometimes find on other ships. Decor is limited to lighting fixtures that unintentionally look like small spaceships, and orange string lights that blink during the crew's fun musical performances (on formal night and the final night). On port days, Destiny offers open-seating breakfast from 7 to 9 a.m., with items like cereal, omelets, yogurt, pancakes and French toast on the menu. It's a great alternative to the crowded buffet, especially if you enjoy a sit-down breakfast with waiter service. On sea days, breakfast is replaced by the sea day brunch and is moved to the Elation dining room. Offered from 8:30 a.m. to 1 p.m., it consists of mostly breakfast items like steak and eggs, huevos rancheros and omelets with a handful of lunch options like Caesar salad, grilled pork chops and tomato soup. We found dinner in the dining room to be significantly better than in the buffet, and it is also much easier for vegetarians, vegans and those with food allergies to have requests accommodated. Dinner menus vary each night, with well-known appetizers like shrimp cocktail and chicken quesadillas, as well as more exotic choices like chilled Vietnamese spring rolls or tiger shrimp creole. There are also side salads and soup du jour (including some unique choices like lychee bisque with lemongrass). With Carnival, you can order as many appetizers and entrees as you like, so don’t be shy if there’s more than one you’d like to try. Carnival also offers a "rare finds" section, where guests can sample more unusual items (like frog legs). Entrees range from honey-glazed pork loin and braised beef brisket, to sweet and sour shrimp or vegetable lasagna. A selection of grilled items like salmon or chicken and an array of sauces are on the menu as well. Plus, passengers can always order side dishes like ratatouille, broccoli, mac 'n' cheese or baked potatoes with the fixings. Some of the excellent dessert options include Carnival’s fantastic melting chocolate cake, cheesecake with fruit toppings, varying flavors of creme brulee and tiramisu, plus a selection of ice creams and a cheese plate that is always available. After-dinner cocktails and specialty coffees can be purchased. On Cruise Elegant nights, the main dining room menu switches to American Feast. The "feast" is a lively celebration during which time the captain and crew are introduced. On this night, there is a dedicated one-page menu with appetizers like lobster bisque, a pasta selection, high-end entrees like filet mignon and a creative dessert of sticky toffee brioche with coconut lime and strawberries. Also on the menu are steakhouse selections, which include lobster, filet mignon and New York strip steak; each carry a $20 surcharge. Paris Restaurant (Deck 10): This is Carnival's main buffet, which has two outside stations and four main stations inside. During lunch on sea days, it can get crowded but there are often a few under-the-radar seats outside the rear of the buffet that have great views. The salad bar is located in the center of the dining room next to the deli, and has a good variety of options for making your own salad as well as a changing cold salad choice (ratatouille, zucchini and other chilled vegetables). The dessert area has a variety of cakes and desserts, as well as two self-serve ice cream machines with vanilla, chocolate and sometimes strawberry. The chocolate cakes were rich, tiramisu was flavorful and not soggy, and parfaits and other desserts also exceeded expectations. Beverages include coffee, tea and juice machines, as well as filtered water that tasted crisp and fresh. Breakfast has classic American favorites like oatmeal, eggs, grits, pastries, sausages, bacon and fresh fruit as well as baked beans and a make-your-own omelet station. Lunch tended to have hearty options like fish with sauces, cheese vegetables and pastas and was similar to the dinner selections, although dinner at the buffet included some specialty items that were also found on the dining room menus, like chicken Florentine or blue crab ravioli. Although Carnival bills the Carnival Deli, Off the Grill and Pizza Pirate as separate restaurants, they are essentially different stations at the buffet. Off the Grill: This is the main section of the buffet and has a changing themed menu like Italian favorites, Latin options or American fare. We found that oftentimes some of the dinner options at the buffet were also offered in the dining rooms. The lines (especially at breakfast and lunch) are long at the grill, and finding vegetarian/vegan options that are clearly labeled isn't easy. Carnival Deli: Attached to the salad bar, the chef at the deli prepares Reubens, corned beef, turkey sandwiches and other favorites that can be pressed on the grill. There was usually a short wait for the deli. Pizza Pirate: Rarely is there no line for this pizza joint, which many consider a cut above the pies on other ships. It's also the only dedicated food venue that is open 24 hours. Pizza options include Margherita, mushroom, four cheese, pepperoni, and prosciutto; gluten-free pies are available by request. Guy's Burger Joint (Deck 10): Just outside of the Paris Restaurant, Carnival's signature burger joint -- in partnership with Chef Guy Fieri -- has replaced the former Comfort Kitchen and Mongolian Wok counters of the buffet. It's hard to come here just once, especially since this venue is typically open from lunchtime through 6 p.m. and conveniently located on the Lido Deck with shaded seating. BlueIgunana Cantina (Deck 10): Burrito-lovers take note: BlueIguana is a pool deck favorite, featuring burritos, tacos, arepas and more (for lunch -- and breakfast). A stellar toppings bar means you can customize your plate with salsa, cilantro and even a slice of watermelon. Room Service: Free room service options include breakfast and all-day items. Basic Continental breakfast choices include yogurt, pastries (a gluten-free bread option is available), fruit, cereal, coffee and orange juice (not freshly squeezed). Place the form with your selections on the door knob the night before and it should arrive within the half-hour indicated. Important to note: The morning the ship arrives in Havana is an early one for anyone catching a group tour -- tons of people clearly ordered room service breakfast and this delayed our order, giving us 10 minutes to scarf down our food before running to meet our group. The all-day options include a variety of deli sandwiches with chips, pretzels or potato salad (which we found bland), salads and a vegetable platter with blue cheese dressing. We ordered room service twice and it took about 30 to 45 minutes each time. Chef's Table (various locations); $75: For a change of pace from the dining room or the buffet, the once-per-cruise Chef's Table is a great option, typically held in the library. The multicourse dinner is hosted by the chef and includes a behind-the-scenes galley tour and cocktail reception. It can be reserved online or onboard. Sushi at Sea (Deck 9); a la carte: Replacing the Taste Bar counter along the promenade, Sushi at Sea offers cruise passengers sushi or sashimi by the piece or roll, from noon to 11 p.m. on a sea day. You can purchase one piece for $1.50; rolls range from $5 to $7.50 and the menu is limited to about four rolls. 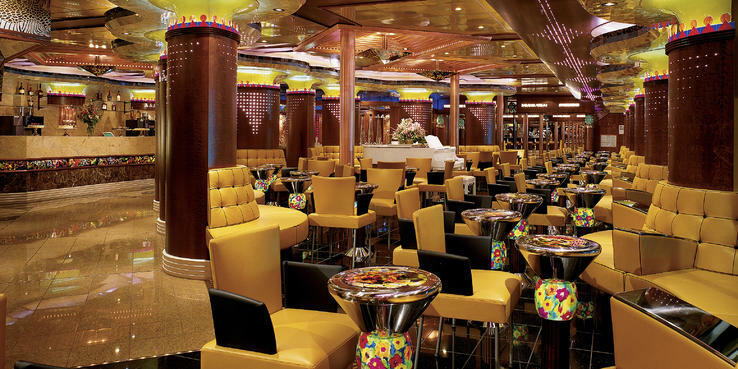 Cafe lle de France (Deck 9); a la carte: Although the buffet has plenty of American coffee, Cafe Ile de France serves up Italian espressos, lattes, frozen coffees and even "spiked" coffees (although no Cuban coffee) at prices that range from $2 to $6. The shop also has a small variety of pastries and sweets for a price. Cafe hours vary, but it is open surprisingly late (until midnight most nights). Green Eggs and Ham Breakfast (Destiny Restaurant, Deck 8); $5: On one morning during the cruise, Destiny hosts a special "Green Eggs and Ham" breakfast with costumed characters from Dr. Seuss' books. Yes, the eggs are green, but there are other options on the menu like French toast and pancakes. The characters perform a dance number that kids love and pose for photos with anyone who wants. Room Service: Additional items like chicken tenders, quesadillas, fried shrimp and Philly cheesesteaks can be ordered for around $5 to $7.